Friday August 15th 1884. I worked about the house all the forenoon while Mother went to town with Rob. I worked after dinner cleaning up Robs room as it is finished. Hatt with Edith, Mollie Stevens and Minnie Mc were here for supper. Weather very warm. Saturday August 16th 1884. I did the work in the forenoon while Mother was in town. I finished Robs room right away after dinner and went to town. I brought Edith hoome with me. Mr Free was here all night. Sunday August 17th 1884. It was a rainy day. I worked about the house most the forenoon played on the piano in the afternoon wrote to my old friend Lou Simpson in the evening Edith still here. Monday August 18th 1884. I helped some with the work and sewed on muslin what time I could spare. Mollie Stevens was here all night. 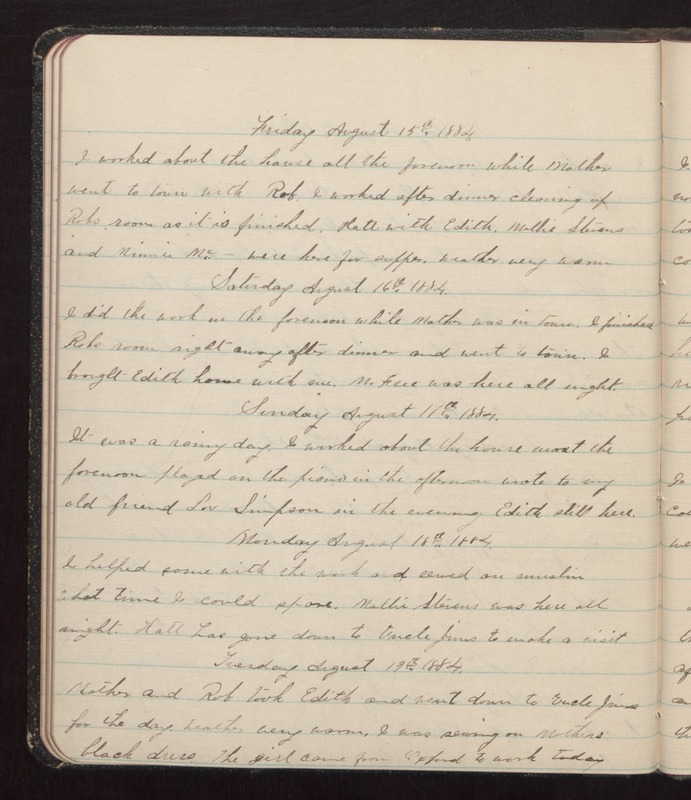 Hatt has gone down to Uncle Jims to make a visit Tuesday August 19th 1884. Mother and Rob took Edith and went down to Uncle Jims for the day. Weather very warm. I was sewing on Mothers black dress. The girl came from Oxford to work today.